Good Bye From the Blog Team: See You in the Fall! I’m just popping in here to let our readers know that we are approaching the end of our semester, which means that we’re concluding our blogging schedule for the time being. While we here at The University of New Mexico enjoy a reprieve of summer term, we hope that you, as educators around the country, do, too! We’ll be back in August to share more resources with you and to continue our conversations around diverse literature in the classroom. I also wanted to add a few personal notes on behalf of our whole blogging team here at Vamos a Leer. For my own part, I will not be returning next year as a Mira, Look writer, since I am graduating from the UNM Latin American Studies Master’s program in just a couple weeks. I have greatly enjoyed these past two years working for this awesome blog, though, and I look forward to keeping up to date on future posts and publications! This summer I will be returning home to my native New York and looking for work while also getting ready to apply to law school for the following year. I’ll definitely miss the southwest sunshine! 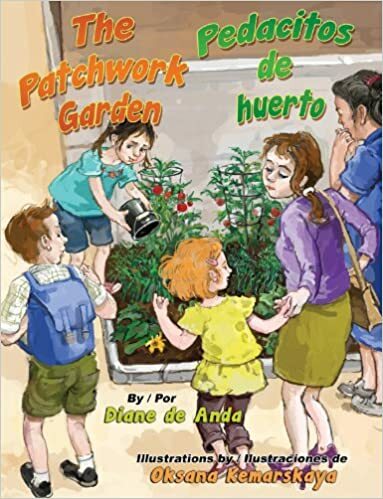 The Patchwork Garden/ Pedacitos de huerto, tells the story of a young girl whose wise Abuela teaches her how to cultivate a healthy and fruitful garden, despite some modern-day challenges: “‘I wish I could have my own vegetable garden,’ replied Toña, ‘but there’s nothing but cement around our apartment building.’” Abuela reassures her, telling her that all you need is a small plot of land– a garden can be beautiful, no matter how small. With this information, Toña realizes that there is a little patch of dirt behind the neighborhood church that might be suitable for her garden, so she goes to ask Father Anselmo for permission to use it, adding that he can take as many colorful, sweet vegetables as he’d like: “‘Ah,’ said Father Anselmo, thinking of the fresh salads and steamed vegetables, ‘beautiful and healthy.’” As Toña and her Abuela embark on their journey of organizing a plan for their garden, they enlist the help and support of the community, simultaneously teaching others about sustainable living and healthy eating, while also fortifying their community bonds. Join us May 22 at Casa Rondeña Winery (733 Chavez Rd, Los Ranchos De Albuquerque) from 5:00-7:00 pm to discuss our next book. 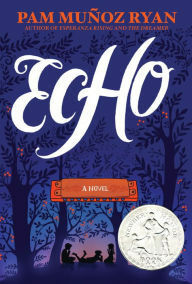 We are reading Echo by Pam Muñoz Ryan. 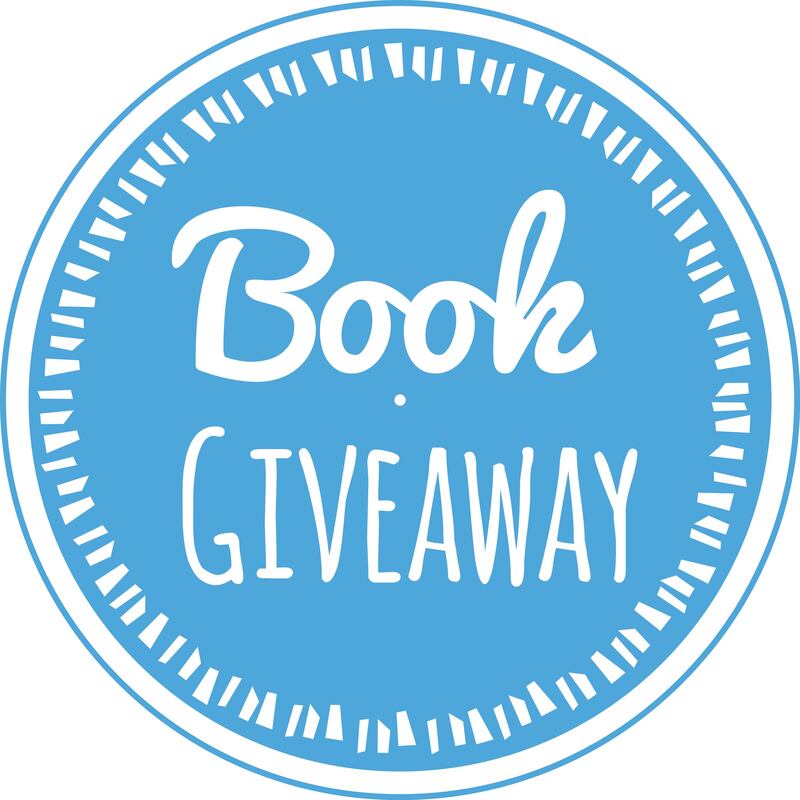 Be sure to get entered in our drawing for a free copy of the book!! All you have to do is comment on any blog post by May 8! We hope to see you on May 22! Saludos todos! This week we are continuing our theme of nature in celebration of this month’s Earth Day with another great read. The Shark and the Parrotfish and Other Caribbean Fables, written by Mario Picayo and illustrated by Cherise Ward is a lovely collection of fables that take place in various parts of the Caribbean, incorporating characters based on all of the region’s abundant and diverse flora and fauna. 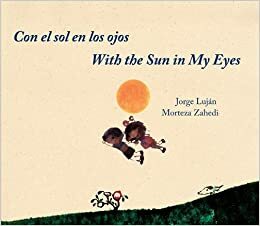 This book is perfect for this month’s theme as it embraces many of nature’s wonders, while also anthropomorphizing animals and insects, reminding us of our closeness to nature, and helping readers sympathize with many species’ current plight of habitat destruction and resource scarcity. The setting of the Caribbean is also conducive for this month’s discussions on climate change, conservation, and eco-friendly living, as this region of the world, arguably one of the most beautiful and biodiverse, has also been one of the most affected by environmental exploitation, species extinction, and ecological destruction. Furthermore, as explained in the introduction of this book, each story is a fable, meaning that it contains a moral or a lesson to readers. As we take this month to reflect on the state of our planet and many of its glorious ecosystems, let us also reflect on the moral of this collection as a whole, as well as all of this month’s books: to save our ecosystems, care for our planet, and live responsibly. In a note to the reader at the beginning of the book, the author introduces the genre of the fable, and explains many of the fable’s characteristics, such as being passed down from generation to generation, and usually including a moral or a lesson for the reader: “A fable is a story, but it is a special kind of story that teaches a lesson. We call that lesson a moral. Many fables are about animals and plants that talk and act like people.” The author also explains how Aesop is one of the most well-known fable-writers, but how this collection, rather than focusing on a European or African heritage, like many of Aesop’s stories, focuses on the Caribbean: “But I was born in the Caribbean, not in Africa or Europe, so my stories don’t have lions, foxes, or grapevines. Mine have mongooses, genip trees, and sharks.” Here we see how the fables’ focus on the Caribbean’s diverse flora and fauna is not only something that makes these fables so fascinating and intriguing, but also something that makes them distinctly Caribbean. In other words, our natural surroundings are not just a matter of environmental concern, but also of cultural identity, patrimony, and heritage. When we jeopardize and endanger earth’s species and the natural habitats of the world, we stand to lose not only our rich ecosystems, but also our culture, our national identities, memories, and ways of life. Saludos todos! This week we are taking the time to feature author Socorro Acioli, writer of this month’s featured book, The Head of the Saint, and the topic of our April book group meeting. Like with our previous authors, we take this time to feature the breadth of the author’s collective oeuvre, as well as the more personal aspects of her life. Socorro Acioli is a Brazilian author who holds a Master’s degree in Brazilian literature and is currently pursuing her PhD in Literary Studies at the Universidade Federal Fluminense, Rio de Janeiro. 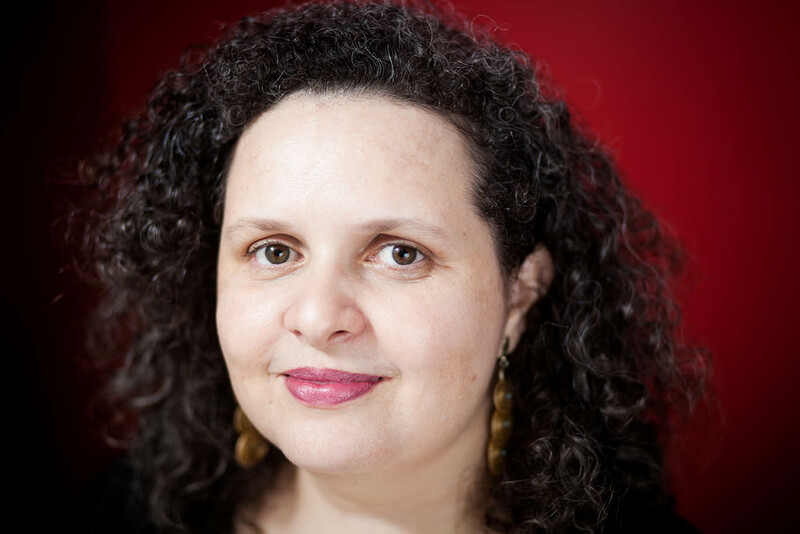 Although Aciolo’s literary career as a novelist and children’s book author is relatively new, she has already garnered worldwide recognition and prestige. She has lectured internationally and was a visiting researcher at the International Youth Library in Munich, Germany. Acioli also took part in a workshop called ‘How to tell a tale’at the San Antonio de Los Banõs International Film and Television School in Cuba. The workshop was conducted by Nobel Prize-winning author, Gabriel García Márquez. Márquez chose Acioli himself to be a participant in the workshop based on her recent work The Head of the Saint.